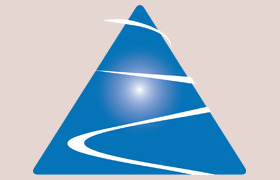 The Legacy Planning group asked us to redesign their logo, which had been a navy blue pyramid divided horizontally by 2 white lines. Our interpretation of the logo resulted in a sky blue version with rounded corners, a swoosh to replace the rigid white lines, and a starburst. Blue is the color of trust, so we wanted to keep it. We rounded the corners of the pyramid to represent the soft side of legacy planning based on values rather than hard cash and taxes. The starburst in the center of pyramid represents family unity, that all members of family can be on the same page about money and heirs. Finally, the swoosh is symbolic of the journey, ending of course at the top of the pyramid. But because each family is unique, the path is able to veer from the conventional route along the surface and literally “fly off” in the direction needed for success. In addition to the logo redesign, ActiveCanvas designed the corporate Identity Package of business cards, letterhead, mailing labels, and envelopes.